A globally popular, deadly, televised sport. Before The Running Man, Battle Royale and The Hunger Games. But not before the 1968 'Bread And Circuses' TV episode of the original Star Trek had pointed out that the Romans did it first, with huge amphitheatres for the public to watch wholesale slaughter in the name of entertainment. The most deadly gladiators became superstars. Star Trek gave these games a futuristic twist by having the combat televised. 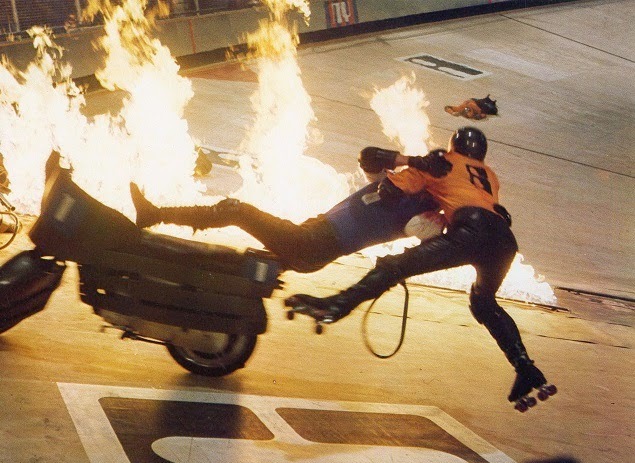 Rollerball expands on that scenario, and is able to show far more violent action. 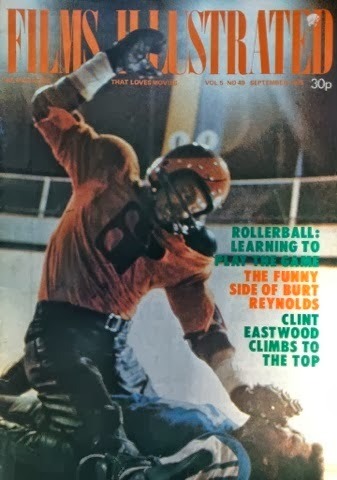 The story envisages a near-future where bloodshed returns as a public spectacle, mixing roller derby and American football, with no holds barred. The players' gloves even have sharpened studs on them, to maximise damage. 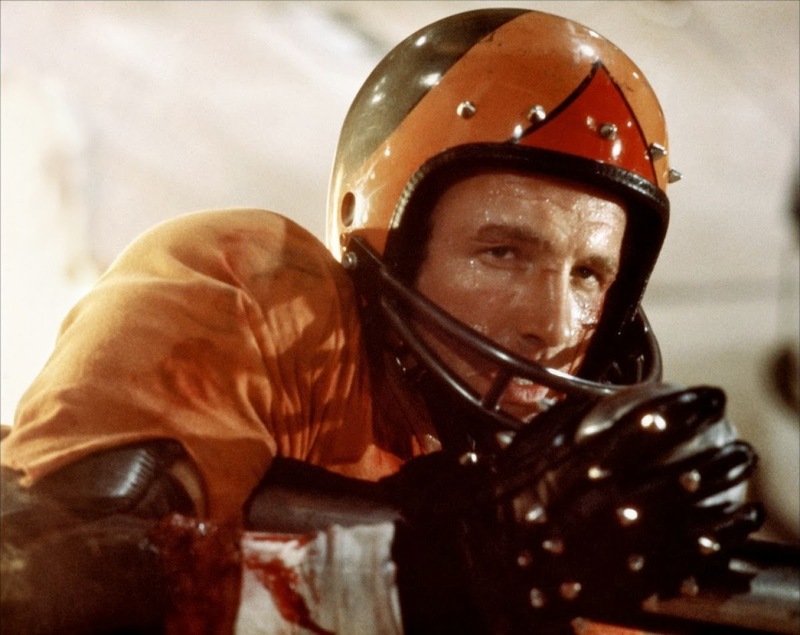 I first saw Rollerball in 1976 because it promised action and violence. The story is focussed on the games and the violent action is actually key to the story. Even though there was a stir in the press about how violent it was going to be, no censor cuts were made and it only had an 'AA' certificate in UK cinemas (no-one under 14 admitted). 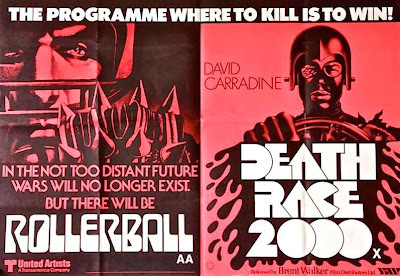 The rollerball matches are bleak, violent and convincingly staged, but the details of this future society are hazy, despite taking up most of the running time. Even then, I'd already seen some great predictive sci-fi where the central concept could easily be sumarised. Soylent Green was about food shortages and overpopulation, The Omega Man was a post-apocalyptic world of luddite mutants... But what was the premise of Rollerball besides the ultra-violent game? There's an interesting backstory that's barely given a chance to show itself. Between games, we don't see much of the world outside of the rollerball champion's luxury homes. Jonathan E (James Caan) is a global star who can get access where mere mortals aren't allowed. He's not interested in the world he lives in, he just wants to find the only woman he ever loved. For information he visits the library, which no longer contains any books. The librarian reveals that all books have been scanned into a computer and summarised. From which I took that it had been quietly censored. If you're not paying close attention to the dialogue between Jonathan E and his trainer, and some of the locker room banter (in Caan's case the dialogue is also mumbled) you won't know that the world has been taken over by a few consolidated corporations. There's just one in charge of Energy, for instance. The corporations are more important than any country and have now divided the world up among themselves. The rollerball teams don't stand for a national anthem, but a corporation anthem. The real reason there's no more war is because there are no more international boundaries. The world watches Multivision, a huge TV screen with three smaller screens showing alternate angles. But there's only one channel. The women Jonathan E sleeps with are provided and chosen by a corporation. Music is piped into private homes. The future is peaceful, but totally controlled. The past has been edited, presumably to extinguish any references to dissention. Everyone is kept amused by extreme entertainment that takes their minds off what's going on all around them. 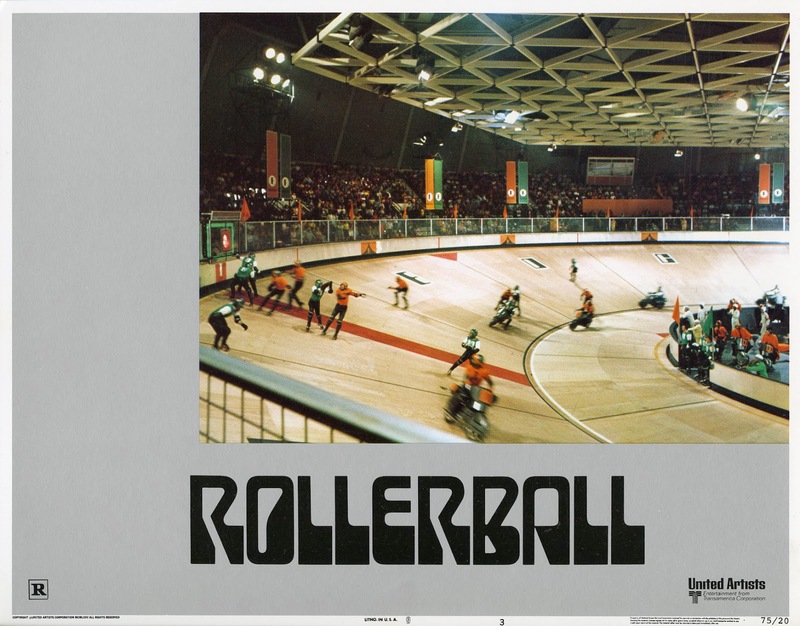 That's what the game of rollerball is about. A barbaric distraction from a world of total control and zero choice. I guess the diverting tactics worked on me too. I didn't care that the story didn't seem to make sense, it was all about the games. And these seem to have derailed the film as well. 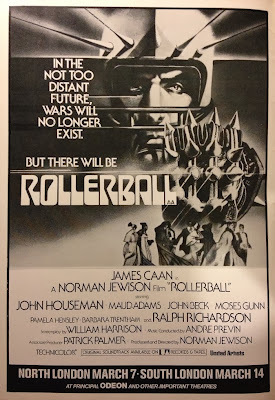 James Caan was reputedly more interested in playing rollerball than anything else, and they're certainly the highlight. Staged on an Olympic German arena that doubles (triples?) for all three stadiums in the film, the skating skills of the cast and stunt performers are superb. Each game packs more excitement than the whole of the 2002 remake. 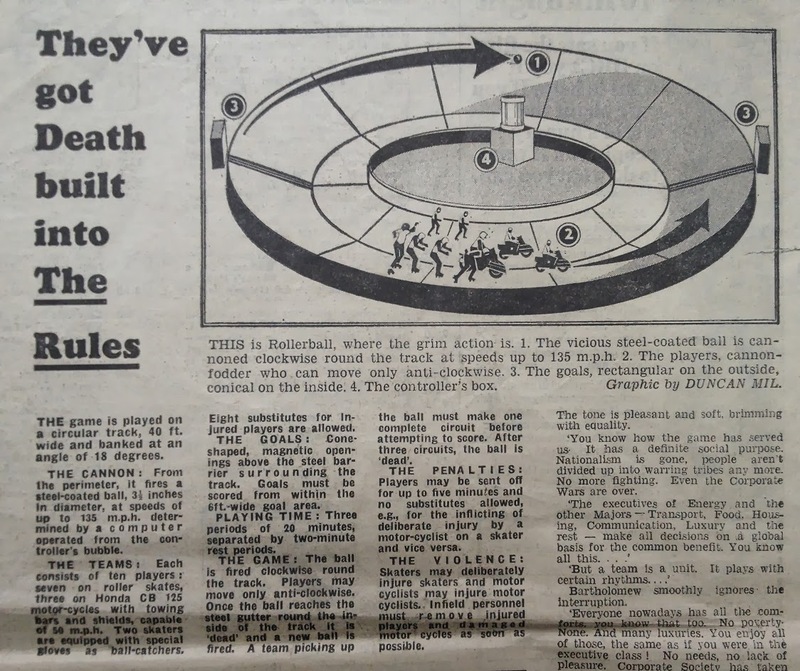 The publicity also concentrated on the game, even the rules appeared in newspapers (though this may also have been because they weren't very well explained at length in the film). The two teams have to fight for ownership of a steel ball (fired at a high speed onto the arena). The player with the ball has to complete a circuit of the arena before landing it an electromagnetic goal. The players are all on rollerskates except for the motorbike riders. They're allowed to punch and kick the opposition to gain possession of the ball. If it hits the floor, it's out of play. I'm guessing the Daily Mail complained about the film, as well as Death Race 2000 and The Sweeney on TV as examples (and causes) of an increasingly violent society. 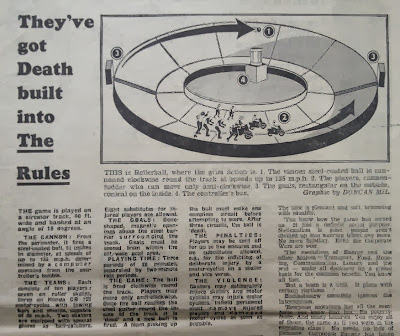 However, the paper also publicised the film with three days of double-page centrespreads (the first is above) telling the story of the film, in the lead-up to its London premiere. James Caan looks great on skates and a totally convincing champion of the world. But he never convinces that he could evade and outwit everything that the corporations could throw at him, when he starts to disobey. 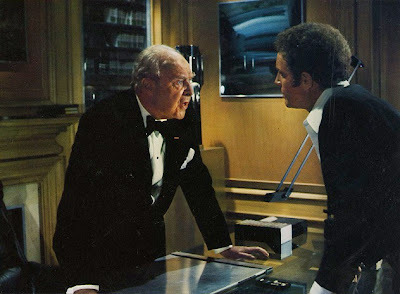 As I mentioned, Caan isn't keen to say his dialogue clearly, in stark contrast to John Houseman who appears to be over-enunciating, especially the name "Jonathan E", in an attempt to improve Caan's diction by osmosis. Co-star Maud Adams (above) had just been a Bond Girl in The Man with The Golden Gun. Jonathan E's easygoing sidekick on his Houston team is played by John Beck, who at the time seemed destined for leading roles and stardom, but after Sky Riders, The Big Bus and Audrey Rose he was soon back to TV. The cinematography is clinical but covers the action impressively and there's a great use of the futuristic architecture around Munich, Germany, including the multi-cylindrical BMW building that also appears in the middle of Suspiria. William Harrison expanded his original short story, The Rollerball Murders, into the script. 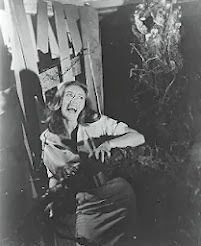 What happened to it then was up to director Norman Jewison (and apparently Caan). Shame that Harrison didn't then novelise his ideas for this expanded scenario of his script. 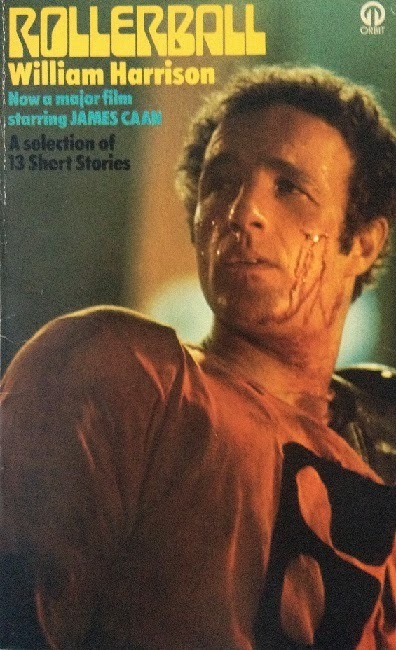 The above tie-in only contains the original short story. Though he eventually published a set of essays about his life and work in 2010 - The Rollerball Mutations. While writing this, I've learned that Harrison recently passed away, in October. Reading through old movie magazines, the exact timing of Rollerball's release in the UK threw up a mystery. 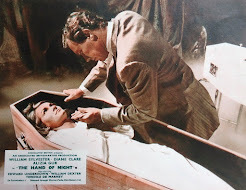 The Daily Mail and Photoplay coverage support that it premiered in London in September, 1975. But the above advert for a wider release is from March, 1976. 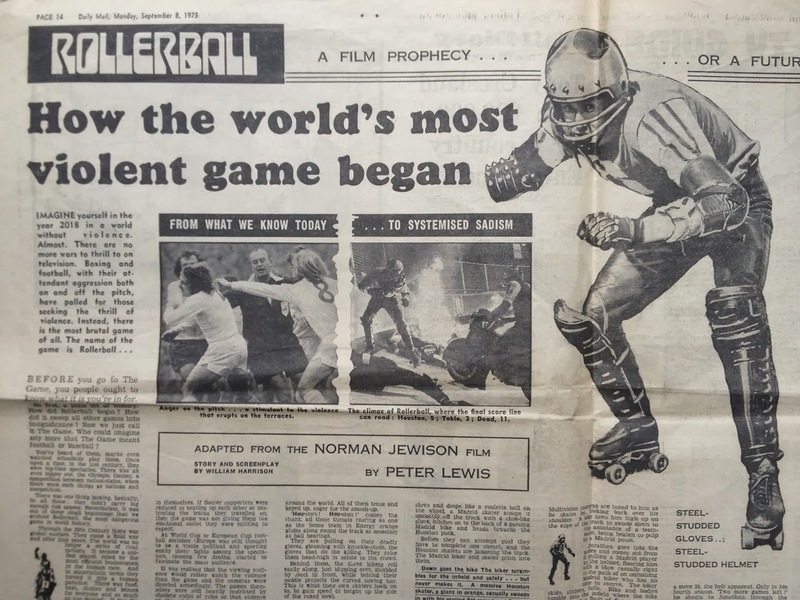 Did Rollerball run in the West End for six months before going on general release? That's unusual. It certainly means that it was popular and made money. It was repeatedly re-released over the next few years, once on a double-bill with Death Race 2000 (below) and I saw it again when it was paired less obviously with Juggernaut. 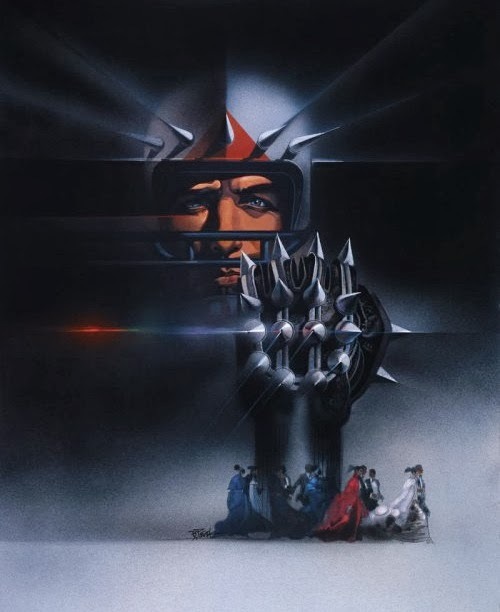 The key art for the Rollerball poster (at the very top) was instantly an iconic image. 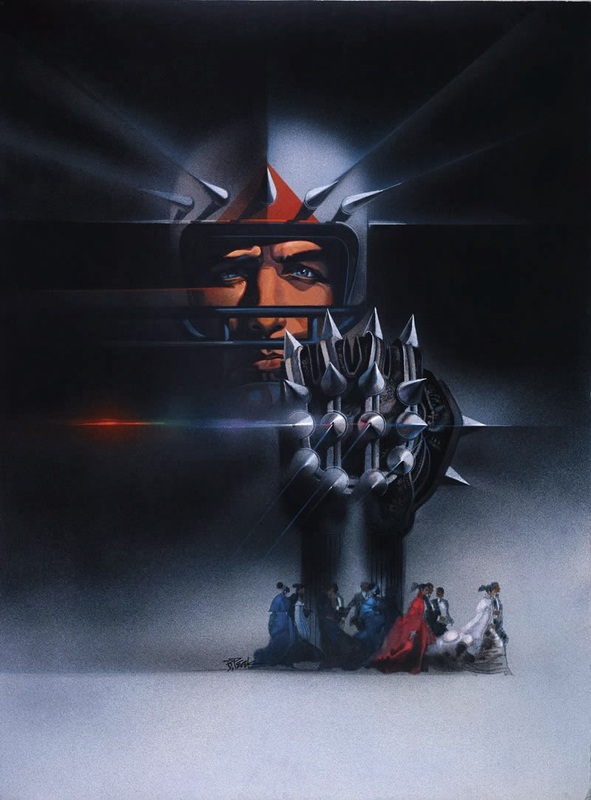 It was painted by Bob Peak, responsible for many other beautiful posters for great films... More examples of the poster art of Bob Peak here on Steve Lensman's site. 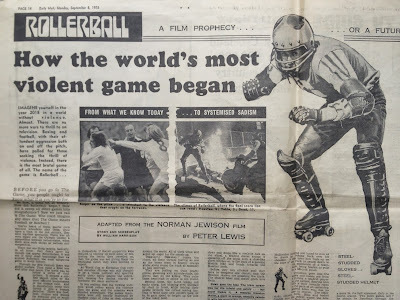 Rollerball is on DVD in a special edition with commentary by director Norman Jewison, pointing out how many of his predictions have since come true. 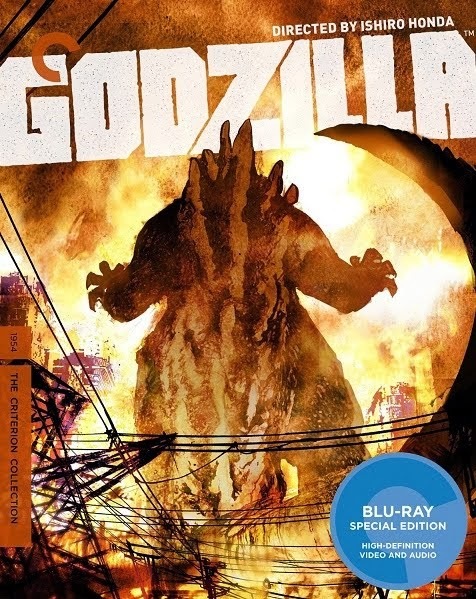 The cinematography alone deserves blu-ray treatment, besides the film's cult status. And now I need to see this movie! I saw the remake which was pure garbage...a true disaster of a film, but this one sounds far superior. Looking forward to seeing it. 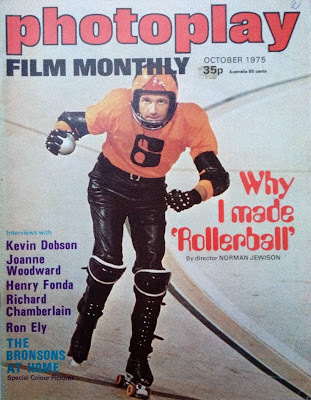 ROLLERBALL has always suffered from a poor rep. Even amongst genre critics it was generally disparaged and compared unfavourably to DEATH RACE 2000. I myself didn't see it until the 2000s via an ugly looking non-anamorphic DVD. It's weird that it's now considered something of a 'cult film'. Is it? If so, when did this happen? I'm not sure. 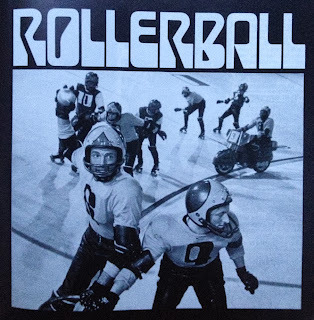 I see quite a few people wearing ROLLERBALL t-shirts and wonder if they've even seen the film or even know what the shirt they're wearing even refers to!